The first verb tenses to teach ESL students are the Simple Present and the Present Continuous (also called the Present Progressive). Although a thorough lesson plan teaching these two tenses will include the functions of the two tenses, ESL learners will need practice to determine when to use the Simple Present or the Present Continuous. ESL cloze exercises can be used for student practice or for testing the student. Below is a cloze exercise using the Simple Present and Present Continuous. You can also download this exercise as a pdf file. You will be sent to a "file hosting" site and you can download the pdf version from there. Click the "Click here to start download" button. Instructions: Fill in the blanks with the correct verb tense. 1. Every Saturday, John (drive) ____________________ his son to soccer practice. 2. Usually, I (work) _____________________ as a professor at the National University in Tokyo, but this summer I (study) _____________________ English in the United States. That’s why I am here in the U.S.
3. Shhhh! Be quiet! The baby (sleep)______________________. 4. Don't forget to take your umbrella. It (rain) ___________ __________. 5. It (always, snow) ___________________ a lot during the winter. 6. I'm sorry, but I can't hear what you (say) _________________ . Everybody (talk) ___________________ so loudly. 7. Maria (write, currently) ___________________ a book about her experiences in the U.S.
8A: Do you want to go for a walk around the lake? I (want) _____________ some exercise. 8B: No, I can't. I (watch) _____________________ my little sister. 9. The business cards (be, normally ) _____________________ printed by a company in San Francisco. Their prices (be) _________________ inexpensive and the quality of their work is good. 10. The children (eat) ____________________ too much candy. They are going to be sick! 11. She (always, call) ____________________ her mother when she gets home. 12. Ron and Kay (look) ___________________ out the window at the beautiful bird in the tree. 13. They (feed) ___________________ the birds every day. 14. I (always, play) ___________________ on Thursdays. 15. I can’t understand what he (say) ______________. He (speak) ______________ too fast! One good method for teaching the Simple Present tense (or any verb tense) to ESL students is to have them use the tense to describe their own life experiences. For example, there are two functions for the Simple Present: (1) to express general truths (e.g., The sun rises in the East) and, (2) to express habits or rituals. Asking the student to express habits or rituals in his or her own life will help to reinforce the latter function of the Simple Present tense. Every day, I wake up at 8 a.m. I feed my two cats. I meditate for twenty minutes. Usually, I eat cereal with milk. Then, I take a shower. Next, I prepare for my students. I leave my house at 10 a.m.
You may notice from this list that you can also ask the student to include “time markers” (next, then, after, etc.) if you’ve already covered these. For any homework assignment where I am asking the student to write something from scratch (as opposed to something like a cloze exercise where most of the language is already provided), I ask the student to give me sample answers before he or she leaves our tutoring lesson. For example, for this Simple Present exercise, I will ask, “What do you do every day?” or “What time do you get up? When do you eat breakfast,” etc. This way, the ESL student is producing the language and should have an easier time of it when they do their homework on their own. As discussed in Fundamentals of Teaching Verb Tenses, ESL students must know five forms of each verb in order to thoroughly conjugate a verb. Students must know the following verb usages: affirmative, negative, yes/no questions, short answers and WH- questions. Here is a thorough verb conjugation for the Simple Present verb “to walk.” Each sentence is missing one word. 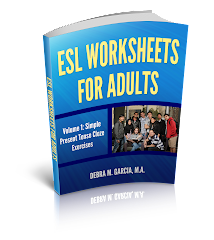 Click here for a pdf version of this ESL cloze exercise. Or click here for the exercise in a table format. You'll be sent to a "file hosting" site and you can download the pdf version from there. Click the "Click here to start download" button. Directions: Fill in the blank with the correct form of the verb “to walk” OR the correct “helping” verb. 1. I ______ to school every day. 2. You ______ to school every day. 3. He/She/It ______ to school every day. 4. They ______ to school every day. 5. We ______ to school every day. 6. I ______ walk to school every day. 7. You don’t ______ to school every day. 8. He/She/It ______ walk to school every day. 9. They ______ walk to school every day. 10. We don’t ______ to school every day. 11. Do I ______ to school every day? 12. ______ you walk to school every day? 13. Does he/she/it ______ to school every day? 14. ______ they walk to school every day? 15. Do we ______ to school every day? 26. When do you ______ to school every day? 27. Why do ______ walk to school every day? 28. Where ______ she go to school every day? 29. How does ______ get to school every day? 30. What ______ they do at school every day? For more information about cloze exercises, see my ESL cloze exercises page. “What is a cloze exercise?” A cloze exercise is basically a fill-in-the blanks exercise. It can be used for ESL exercises or as an ESL quiz or test. ESL cloze exercises can be used to help reinforce (and test) student’s learning of verbs, articles, prepositions, pronouns, etc. Basically, cloze exercises can be used for all grammar lessons, teaching any part of speech, or for vocabulary reinforcement. 1. She __________ never __________ to Germany. 2. They __________ always __________ each other. 3. I __________ __________ to Mexico many times. 4. __________ you ever __________ squid? 5. __________ she __________ the movie yet? You can see from these sample ESL cloze sentences that the student has more than one choice for the main verb. He or she just has to make sure that the correct form of the verb (the past participle) is used. The “helping” verb can only be “has” or “have.” It depends on the subject. In short, there can be some flexibility in the answers of a cloze exercise, especially for advanced ESL students. I would limit the possible answers of ESL cloze exercises for beginning students. You can do this by providing a list of the possible answers and instruct the student that each answer can only be used once. When I teach lessons to ESL students on how to pronounce regular Simple Past tense verbs (those ending with “-ed”), I first have to teach the concept of “voiceless” sounds and “voiced” sounds. The “-ed” endings of regular past tense verbs are pronounced in three different ways. They end with either a /t/ sound, a /d/ sound, or an /ed/ sound. Verbs ending with an /ed/ sound are easier to teach. Determining whether a past tense verb ends with a /t/ or /d/ sound is more difficult for ESL students. See English Past Tense Pronunciation for more info. To distinguish a voiced sound, I have the student determine the final sound of the base form of the verb (before adding the “-ed”). For example, for the word “save,” the final sound is "vvvvvv". I then ask the student to hold three fingers to their throat and make the sound "vvvvvv". I ask them if they feel a vibration in their throat. If there is a vibration, then the ending is pronounced as a /d/. To distinguish a voiceless sound, I have the student determine the final sound of the base form of the verb (before adding the “-ed”). For example, for the word “miss,” the final sound is "sssssss". I then ask the student to hold three fingers to their throat and make the sound "sssssss". I ask them if they feel a vibration in their throat. If there is no vibration, then the ending is pronounced as a /t/. When using this method in a lesson to teach pronunciation of Past Tense verbs, you really have to demonstrate the way to determine if the sound vibrates or not. ESL students sometimes feel silly or are otherwise reluctant to put their fingers to their throats and make a funny sound. So I consistently model what the student should do. The mistake students usually make during this pronunciation lesson is that they look at the last letter and say the letter, rather than make the sound that the letter makes. Following a lesson plan on the Simple Past tense (verb conjugation, form, and function), I usually also teach my private ESL students how to pronounce past tense verbs ending in “-ed,” although this isn’t always necessary. Some students have already learned correct pronunciation in their native countries, although there will usually be some problems. If the problems are consistent or serious, then I’ll do a pronunciation lesson right after the verb conjugation and usage lesson. Deciding when to use the “/ed/” pronunciation is pretty simple. The English as a Second Language student just needs to remember that this ending is used only for verbs ending with a “t” or “d” sound. A lesson plan teaching the ESL student how to differentiate between verbs with a “/t/” sound ending and a “/d/” sound ending is a bit more difficult. Many students will think that it is just a matter of memorizing which letters at the end of the word take a “/t/” and which take a “/d/.” This will work for many verbs, but not all. The better rule is to teach ESL students how to determine if the ending sound of the base verb is “voiced” or “voiceless.” The “ed” ending of voiceless sounds takes on a “/t/.” Voiced sounds take on a “/d/.” For more information on voicing, see Voiced and Voiceless Sounds. After the present tenses (Simple Present and Present Progressive), the Simple Past tense (also called the Past Simple) is usually the next verb tense ESL students are taught. The Simple Past tense has “regular” verbs and “irregular” verbs. Regular Simple Past tense verbs are formed by adding “-ed” to the end of the base form of the verb (eg., walked, dressed, called, etc.). For verbs that already end with an “e,” just add a “d” (e.g., cared, raced, decided, invited, etc.). Verb conjugation of the affirmative Simple Past is pretty easy. There is only one form of the verb no matter what the subject is. 1. I talked. I walked. I danced. I cared. 2. You talked. You walked. You danced. You cared. 3. She/He/It talked. She/He/It walked. She/He/It danced. She/He/It cared. 4. They talked. They walked. They danced. They cared. 5. We talked. We walked. We danced. We cared. Besides remembering to use the correct helping verb (“to do”), students studying English as a Second Language also have to memorize irregular Past Tense verbs (irregulars don’t follow the general rule of adding “-ed”) and they also have to learn about changing the spelling of verbs that end with “y” (e.g., "study" becomes "studied") and some consonants (e.g., "drop" becomes "dropped"). For a more thorough explanation and Simple Past exercises (as well as every other verb tense and lots of grammar tips), see Azar's Understanding and Using English Grammar . When Teaching English to Speakers of Other Languages (TESOL), it's very useful to teach the ESL student some "survival questions." I always teach my beginning students the following questions. They are useful during our one-on-one tutoring sessions, and more importantly, they are useful in the real world. (2) Can you please speak slowly, please? (3) How do you spell __________? (4) What does __________ mean? (5) Can you give me an example? (6) How do you say ___________ in Japanese/Spanish/French/etc. . . .? As I mentioned yesterday, most of my ESL students are advanced English speakers and prefer to work on their English speaking skills. However, I occasionally teach English reading skills. The following is the format I use for an ESL reading lesson plan when teaching classes with more than one student. I use a modified version of this lesson plan approach when tutoring one-on-one. Step 1: Engage the student. The purpose of engaging the ESL student is to introduce the theme or topic of the reading passage. The student can be engaged, for example, by using visuals or a “warm-up” conversation. If you use visuals, the ESL tutor can ask question like, “who do you think lives here?” The teacher should elicit responses from the students, but the majority of the talking should be done by the student(s). Step 2: Pre-teach new vocabulary. Decide beforehand the vocabulary that is critical for the ESL learner to understand the story. Spend a little time teaching the new words or key words. Step 3: Ask a focus question. Write a question about the reading passage. For beginning level ESL students, pick a detail about three-quarters of the way through the text. For advanced level ESL students, ask a “gist” question. This will be something that the student has to deduce from the reading. Step 4: The student reads. Allow enough time for the ESL student to read the passage. Step 5: Ask the student the focus question. In addition to asking the focus question, ask the student a few other questions about the reading. If the student is unable to answer the questions (and if the ESL teacher has asked appropriate questions), allow the student to reread the passage. Step 6: Follow up with a task. The task can be oral or written. This allows the student to bring in his or her knowledge on the topic. Step 7 (optional): Follow up with an activity. The ESL activity could be additional writing practice or speaking practice. The ESL tutor could also use this English reading lesson plan guide to teach grammar embedded in the reading passage. Most of my adult ESL students are advanced English speakers and primarily want to work on conversation skills, first, and grammar, second. It's mostly my beginning ESL students who need to improve their reading and reading comprehension skills. Finding materials geared towards adults at beginning English levels can be challenging, especially if you don't have a school budget to support you in your supplies acquisition. The one website I've been recently using for short reading passages is rong-chang.com. This is mostly an online interactive website for students, but I copy the passages onto a word document and print them out for my students. I can then use these short ESL reading passages during my tutoring sessions. Today is tax day in the U.S. While there are many upsides to being self-employed, there are also a few downsides. Today is a downside. This is not tax advice for ESL tutors or any other self-employed person. It's just the stuff that I have to take care of to meet my obligations to the U.S. and state governments. As a self-employed person, I have to keep a lot of records. I have to record all the payments I receive from my students (which I do by writing each payment in a receipt book and I also give my students a receipt), I have to keep all the receipts for expenses I have, such as copy expenses, office expenses, ESL books, and other ESL resources. I also keep receipts for classes I take that help me to become a better ESL tutor. All of these receipts are very important because they help me to reduce my tax liability, and especially the dreaded self-employment tax. I teach in a coffee shop, so I am also able to deduct 50% of the money I spend there on things like coffee when I am meeting with students. I have a home office that I use to prepare all my lessons, etc., but I don't deduct a portion of my rent as a business expense because I don't use my home office regularly and exclusively (I think those are the tax terms) for my business (although many friends have pointed out that I actually do use it this way). Many self-employed people use programs like Quicken for record-keeping. Although record-keeping is a pain in the neck, my income and expenses are fairly simple so I use Microsoft Excel to record all my business transactions. Again, this isn't meant to be tax advice, just a list of the things that are on my mind today, tax day. And because life happens and things unexpected happen, I'll actually be filing an extension and estimated payments today. I'll worry about my taxes tomorrow. After all, tomorrow's another day. I've mentioned before that I advertise for ESL students on craigslist.org. This is my primary source of advertising and marketing. My other source is referrals from past students. Students work with me for a few months and either return to their countries of origin and/or have met their English language goals, so I often need new students to replace old students. I regularly run an ad offering my tutoring services to English learners in the Lessons section of craigslist.org. Without fail, right after I post my ad, I receive one to three offers from someone claiming they are from another country and they would like me to teach their children because their children are going to be in the U.S. "on holiday" and they want their children to keep busy, etc. They will also ask me for my rate for three or four weeks, my address, phone number, etc. They tell me that they need this information so that they can send me a money order or cashier's check. Their email will never be in correct English although some claim to have grown up in the U.S., but are now living abroad. It will usually be in all bold letters. Over two years ago, when I started using craigslist to find students, I actually fell for one of these scams (for a little while). I corresponded with the scammer, providing most of the information he requested and asking him for more information about his son (age, level of English proficiency, etc.). He said he wanted to hire me for two-hour lessons, five days a week for one month. I actually started planning my work (and vacation schedule around this scammer). I didn't receive any money, but the month came and went and the "student" never showed up. A couple of weeks later, I got another email explaining that there had been a family emergency. By this point, I finally realized that I was the target of a fraud scheme. The way it works is that the person saying they want English lessons eventually sends you a cashier's check or money order for an amount over the amount of the total English lessons. Then the ESL tutor is supposed to reimburse the scammer for the overage. It takes about a month for banks to discover that a cashier's check is fraudulent. In the meantime, the scammee has sent real money to the scammer. This scam is not only used on English tutors. Someone tried to scam a student of mine who was selling a car. It's the same idea. The scammer sends you payment for over the amount of the transaction and the victim is supposed to return the excess payment. I just think it's really low to try to scam teachers! Here’s a copy of the contract I use for ESL tutoring services with my students. Please note that this is only a sample and is not legal advice. It’s just what I do with my adult ESL students. I don’t know how to turn it into pdf, but you should be able to do a copy-and-paste. For more information about ESL tutoring contracts and why they are good idea, please see Using an ESL Tutoring Contract. This contract outlines the terms and conditions for tutoring services provided by __________________ (Tutor) to __________________ (Student). Tutor will prepare ESL lessons for tutoring sessions designed to help Student make progress in the areas agreed to by Student and Tutor. Tutor agrees to provide ESL lessons to Student according to the Tutoring Schedule listed below. Tutor agrees to be on time for each lesson. Tutor will wait for Student at least 20 minutes in the event that Student is late. Student agrees to be on time for each lesson. Student will wait for Tutor at least 20 minutes in the event that Tutor is late. Student will make every attempt to complete any homework agreed to by Student and Tutor. This schedule may be modified when needed and as agreed to by both Student and Tutor. The rate for a one hour ESL lesson is $____ per lesson. The rate for a 1 ½ hour ESL lesson is $____ per lesson. The rate for a two hour ESL lesson is $____ per lesson. At the beginning of the first class, Student must pay a Deposit equal to the amount of one class. The amount paid at the first session will be the Deposit plus the amount for the first class. If Student needs to cancel a scheduled lesson, Student agrees to contact Tutor at least 24 hours before the scheduled lesson. Student may contact Tutor by email or by telephone, preferably both. Student and Tutor agree to reschedule the canceled lesson as soon as possible. Student forfeits the deposit paid for a scheduled lesson if Student fails to give at least 24 hours notice to Tutor. That means that Student pays for the missed lesson. Any exceptions to this policy must be discussed between Student and Tutor. Student also forfeits the deposit if he or she is later than 20 minutes to a scheduled lesson without calling Tutor. Either Tutor or Student may cancel this contract at any time with 24 hours notice to the other. I understand and agree to the terms and conditions set forth above. 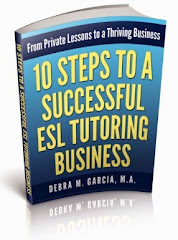 I use a tutoring contract with each of my ESL students. My first meeting with a student is always free. This is where I do a Needs Assessment with the student. At the end of the first meeting, usually when we are discussing payment and scheduling, I give them a copy of my contract. Depending on time constraints, we may review the contract in detail. Usually, I just point out the most important features of the ESL contract. The most important thing I want students to know is that they must give me 24-hours notice of cancellation, or they will be financially responsible for the missed lesson. I then ask the student to take home the contract and study it to see if they have any questions. If the student comes back to me for our first lesson without having read the contract, we will go over the contract in class. This provides a learning opportunity. Of course, this is all dependent on the student’s level of English proficiency. The contract is beyond the English level of beginning students. Usually, my beginning students are accompanied by someone else (e.g., a spouse or adult child) who is able to help with the translation. I think two really important reasons to have a contract between private tutors and students studying English as a Second Language (or any subject for that matter) is that (1) it helps to further ensure the student’s commitment to learning, and (2) it helps to protect the livelihood of the ESL tutor. Tutoring is my “full-time” profession. I set aside a particular time for each student. If the student does not show up or only gives me an hour’s notice, then I cannot replace the student with another, or otherwise make good use of that time. I’ll post a copy of the contract I use in a future posting for your reference in writing your own ESL Contract. One of the wonderful things about being a private English as a Second Language tutor is that I get to travel vicariously. I get to learn about other cultures from my students. The most recent cultural difference I learned about is between American and Japananese police officers. I have a Japanese conversation student. He and his wife and child are in the U.S. for a year. I recommended my favorite bakery to him. He came back and told me about the experience. He loved the desserts (of course), but he was surprised to see police officers in the bakery buying coffee. Apparently, in Japan, the police officers must take off, or cover, their uniforms when they take a lunch break. And it’s unheard of for them to stop at a coffee shop and buy coffee while they are on duty. This seems like such a small cultural difference compared to the others I’ve learned about through my actual travels and my vicarious travels. And yet, it is so pervasive. In the U.S., we just take it for granted when we see cops at coffee shops, restaurants, etc. In fact, the connection between police officers and donut shops is even a part of our cultural humor! In Japan, a cop having a donut and coffee at a donut shop would be as strange as seeing a Martian in the donut shop. My favorite grammar textbook for teaching English grammar basic tenses is Azar’s, Understanding and Using English Grammar . You can use this book to refresh yourself on the tenses and also to teach your students; plus it has grammar exercises you can give to your students. There are essentially twelve English grammar basic tenses (I'm not including information on the Passive here). Most basic tenses have more than one name. It depends on the grammar book you use and on the teacher teaching the tenses. Here’s a list of basic grammar tenses to teach ESL students. Actually, these can be taught to native-English speakers, as well! You are free to copy this list of grammar tenses and examples, but I’d really appreciate if you cited this website on your copy. I offer three options to my ESL students for the length of our individual lessons: one hour, one-and-half hours, and two hours. In my ads to find new students and when meeting with my students for the first time, I highly recommend that they take the one-and-a-half hour option. Ninety per cent of my students have heeded this recommendation. Most of my ESL students are either working professionals or visiting scholars (as well as parents), so their time is limited. Additionally, the learners that I meet in the evenings are often, as you can imagine, tired from their workday. A two-hour lesson is just way too much. I feel that the last half hour is really a waste of their time and money, as it is difficult for students to continue to focus for such a long period of time. About half of my students travel a long way to meet with me. Some of them prefer to meet me for two hours. One-hour lessons are just not enough (usually), in my opinion. It is often very difficult to cover enough material to make sure that the English student can sufficiently learn and show some mastery of the topic. Of course, for students who only want to improve their English conversation skills through conversation practice, a one-hour lesson is often sufficient. I have had students successfully improve their English skills when only meeting once a week for only one hour, but these students have been willing and able to dedicate a significant amount of time studying outside of class. One-and-a-half hour-lessons seem to work the best for both my students and for me. We can sufficiently cover the topic and have enough time to practice and reinforce the topic, especially some English grammar topics. To encourage potential students to choose one-and-a-half hour lessons, I offer a discount. As for how long we continue to have lessons, this is usually determined by the length of time the student is in the country, or for those who live here (in the U.S.) how their work schedule pans out. Some students have specific goals they want to meet. We stop working together when the student meets his or her goals. A friend sent me this video a long time ago. I couldn't resist sharing it with my readers. You have to hit the arrow two times. Enjoy! 1. By the end of the lesson, student will be able to distinguish Past Perfect sentences from Simple Past sentences. 2. By the end of the lesson, student will be able to demonstrate knowledge of the proper form of the Past Perfect by writing five sentences in the Past Perfect. 3. By the end of the lesson, student will be able to demonstrate correct usage of the Past Perfect by speaking (or writing) three sentences correctly using this tense. 1. They are all related to the lesson topic (Past Perfect tense). 2. They are all measurable. At the end of the lesson, the teacher should not have to guess whether the ESL learner understands the Past Perfect. An objective that states, “By the end of the lesson, student will understand the Past Perfect,” cannot be measured. How do I know if the student understands it or not if he or she does not somehow demonstrate the knowledge? 3. They are all student-focused: “student will be able to…” The objective should not state something like, “Teacher will teach the Past Perfect.” This is not a learning objective. How the teacher or tutor goes about trying to meet the student-focused objectives is the stuff that is included in the rest of the lesson plan (i.e., the steps the teacher carries out during the lesson to help the learner meet the objectives. These steps can include exercises from a grammar book, a conversation focusing on the grammar point, a presentation by the teacher (although this should take only a short amount of time), ESL games, etc. This approach can (and I think, should) be used for all lesson plans, not just ESL or EFL or English lessons. They can be used for history lessons, math lessons, etc. Yesterday, I wrote about teaching verb tenses and verb conjugation. The usual order of teaching tenses is Simple Present, Present Progressive, and Simple Past. ESL students are generally OK through these basic tenses. Then comes the Present Perfect… (can you hear the Jaws shark music in the background?). Here are the three functions of the Present Perfect. Compare the Present Perfect usage to the Simple Past. “I traveled to Brazil in 2004.” The Simple Past is used when a time is specified. The specified time could be "this morning," "yesterday," "at 6pm," "when I was a child," etc. The "unspecified time" function of the Present Perfect tense is often confused with the Simple Past tense. The Present Perfect is used to describe something that has happened many (or a couple of) times in the past. For example, “I’ve traveled to Brazil many times,” "I've eaten at that restaurant twice," "John Grisham has written a few books." Note: This is a general overview of the three functions of the Present Perfect. Use a good grammar textbook, such as Azar’s, Understanding and Using English Grammar, to fully prepare your Present Perfect tense lesson plan. You can also visit my ESL Verb Tenses page for more info about all English verb tenses. I previously wrote about possible locations to meet ESL or EFL students for lessons. I gave a partial list of possible places for private tutoring (coffee shops, libraries, the tutor’s home or office, the student’s home or office, senior centers, and community centers, etc.). After hearing a sad story today, I’d like to encourage you to only meet your students in public places. I met with a Japanese conversation student today. I asked him to tell me about the top news in Japan. I was saddened to learn that a young British woman teaching English in Japan was recently murdered. She was only 22-years-old. My ESL student told me that the teacher’s body was found in the apartment of a man who was likely her private English student. This very sad situation is a reminder that it is best to meet students for private lessons in public places, especially when you are first meeting your student, but it’s probably safest to keep the English lessons in a public space at all times. I have one-to-one tutoring sessions in a very public coffee shop. Many students have asked to meet me in my home or in theirs. They tell me that they are concerned about the noise in a public location. This is a legitimate concern, however, I always insist on a public location. It’s tempting when you are first starting your tutoring practice and trying to get new students to agree to the wishes of your potential student. Encourage them to try the public location and if they refuse, then I would reject the potential student. Another student will come along. The risks are just too high. When teaching verb tenses, verb conjugation is only one part of English grammar. Students can often easily memorize the conjugation for all tenses, but the more difficult part of verb usage is knowing which verb tense to use when. In addition to conjugation, the two main things you have to teach about verb tenses are “form” and “function.” Here’s an overview of these two things. Of course, in addition to this, you would teach conjugation (based on the subject pronouns I, you, he, she, it, they, and we). Here’s an example of the verb “dance” conjugated in the Present Progressive (aka Present Continuous, Simple Present Progressive, Simple Present Continuous—depends on the grammar book or the teacher). The next important thing is the “function” of a particular verb tense. Knowing the function(s) of a tense helps the student decide which particular verb tense to use. The Present Progressive’s main function is to describe something that is in process at this very moment (e.g., Right now, I am writing about verb tenses.). Q: So what are you doing these days? A: I am teaching English to ESL students. A: I am cooking dinner for friends. When a student learns these three elements, he or she has mastered English grammar verb conjugation. Actually, the original question was "Good way for study english?" I was trolling Yahoo and found this question asked by someone from Korea who is trying to learn English as a Second Language. He or she further wrote, "Im Korean. now, i studying english, but my english not well..so, i want to know that good way for study english. I wrote a response to this ESL learner and I'd like to share it here. "The absolute best way to learn any language is to immerse yourself in the language. That means you should live somewhere like the U.S. or the U.K., if possible, and hang out with the natives. You didn't mention if you live in Korea or if you are living in an English speaking country. In either case, you could try to study with an English as a Second Language (ESL) or English as a Foreign Language (EFL) tutor. If you're in the U.S. (and probably other places), you can find a tutor on craigslist.org under the "Lessons" category. Of course, working with a private tutor costs money. If you are living in an English-speaking country, some areas have organizations that match native English speakers with ESL speakers so that the non-native speaker can practice his or her English. This is usually free, however, the native speaker is usually not a trained English teacher. If you live in Korea and can't find a native English speaker to work with, try to watch American films (without subtitles), read English books, websites, news, etc. Also, try to write something every day in English. Don't worry if it's not perfect. The main point is to train your mind to think in English. And find a good grammar book. Try Azar's Understanding and Using English Grammar , although this might be just a bit advanced for you (judging from the grammar in your written question). The next best textbook is Grammar in Use - Intermediate by Murphy. I hope this helps a little. Good luck!" As a private ESL tutor, I get to choose the location to meet my students and hold my lessons. I have been meeting my students at a local café for over two years. On any given day, I may teach ESL lessons for up to 4 ½ hours. Fortunately, the café owners and workers don’t mind my holding a table for so long. Of course, I buy something every couple of hours, and most of my students also buy drinks. This particular café is close to a major university, so there are lots of other students who use this location to study for long periods of time. On a couple of occasions, I’ve noticed at least two or three other tutoring lessons going on (unfortunately, some tutors forget that they are talking to someone across the table and not to a large classroom!). The café is located in a convenient location for most of my students. The biggest convenience is that it’s close to public transportation. This is especially helpful for my students without cars or for those students who live far away and prefer not to deal with traffic or parking. I have some learners who commute quite a distance for their English lessons. Some potential students initially have concerns about the location and ask me to meet them somewhere else. They prefer a more quiet space, like a library or their home. While there is a library nearby, this particular library frowns upon private lessons in their space. I let the potential new student know that I understand their concerns and that it does, indeed, get loud sometimes (it’s also near a busy fire station!). But I let them know that I have been using the space for over two years and that it has worked for all of my students. The café also has the advantage of simulating “real life.” The student has to be able to speak and listen to English under normal circumstances. It improves concentration and focus. A couple of students may have decided not to have lessons with me, but I really haven’t noticed any lack of students due to the location. Here’s a partial list of possible locations for private English lessons: coffee shops, libraries, the tutor’s home or office, the student’s home or office, senior centers, and community centers. It’s kind of fun to meet my students in a café. There’s always fresh coffee! I call it “my office.” Being self-employed has some disadvantages (no health insurance being the biggest disadvantage! ), but it also has some perks. One of my favorite perks is that I get to decide where, and usually, when to work. I met with one of my advanced students today. We are reviewing the Future Perfect and Future Perfect Progressive tenses. At our last session, we finished the chapter in Azar's Understanding and Using English Grammar and I gave my student four additional exercises for homework (cloze exercises). She came back today with the ESL worksheets incomplete. She told me that she had a hard time completing the exercises. It turns out that the exercises I gave her are from the same source I had trouble with the other day for one of my beginning students. Some of the blanks required use of the Simple Future, instead of the Perfect tenses, but the directions said only Future Perfect or Future Perfect Progressive. I really, really must review the ESL worksheets and exercises I get from the web before I give them to my students! We were able to use this experience as a learning tool, but she still needs help learning this tense. I'm going to use some material from Swan's Practical English Usage . I don't think that many English as a Second Language students get much practice with the Future tenses. They are often among the last grammar points taught, and frankly, native English speakers don't use the Future tenses as much as we use other tenses, especially the past. I think this probably says more about how we live our lives than anything else. I've taught quite a few ESL students over the last couple of years and I've noticed one interesting thing that advanced ESL learners from all over the world have in common. The one thing is that almost all of them watch the sitcom "Friends" in their home countries. A couple of summers ago, I taught ESL to a class of about 20 high school students from France. Three of the students spoke almost like native English-speaking high school kids. Their American English accents impressed me most. I asked them how they learned to sound so much like Americans. All of them said that they watched "Friends" and "old" American movies (I was suprised to hear that "old" meant movies from the '70s!). They had never been to the U.S. before and yet their accents were nearly perfect. I've learned from several other advanced ESL learners visiting the U.S. that they also watch "Friends" in their home countries. I've started asking beginning students to watch "Friends." Even though beginning ESL student's English skills are limited, I've found that we are still able to effectively use episodes as discussion topics. The one challenge I've found with using this particular teaching tool is that in my part of the country, "Friends" reruns are played back-to-back. But, the two episodes are from different seasons. There might be one episode with Monica and Chandler getting married and another episode with Monica dating Tom Selleck. This can be a little confusing for the student. And me! Today, I met with a beginning level ESL student. Her homework for the weekend included a cloze exercise (a "filling in the blanks" exercise) using the Present Perfect. Before we started correcting the exercise, she asked me if all the blanks were supposed to be filled in using the Present Perfect. I said, "yes." When we started going over the answers, I realized that the exercises actually required using either the Present Perfect or the the Simple Past. Oops. I apologized profusely to the student for giving her the wrong instructions. However, we were able to make the corrections together and this turned out to be another learning opportunity. I was also able to see her thought processes in determining whether the correct verb tense was the Present Perfect or the Simple Past. I got the ESL grammar exercise from one of the of the sites that I use regularly for exercises. (I had copied and pasted it to Microsoft Word on my laptop (giving all the appropriate credit to the website).) It said that the exercise was for the Present Perfect. Other exercises specified other tenses, so I made the assumption that the whole exercise labeled "Present Perfect" was only using the Present Perfect. This is not the first time I discovered an error in an ESL lesson I got from the Internet. Moral of the story: review the exercise before you assign it to your student! Any English grammar problems here? There's a subject. There's a verb. We have the makings of a complete sentence. But there may be a problem or two. How about verb choice, verb tense and a missing article? This is a sentence one of my beginning ESL students wrote for homework. I believe we were working on the past tense of "to be." (It was a couple of weeks ago, so I don't remember for sure.) OK. It was easy enough to correct the grammar problem of the tense used ("am" should be "was"), but that doesn't make the sentence correct either. I was in a traffic accident. I had a traffic accident. Since this student was a beginner, it was easier (and I hope wiser) to show the correct options with just a little explanation. Knowing how much to explain (the metalanguage) about a grammar point is often a fine line, or at least an invisible one. Too much explanation causes confusion and the student doesn't learn the point you are trying to make. Working with advanced ESL learners allows us to use metalanguage to better explain the grammar points. When working with beginning level ESL students, it's often best to just provide correct examples. I know that my learner finally understood the issues because of the great laugh we were able to have afterwards. She understood what her original sentence meant. And it is kind of funny.